During the fall 2018 semester, a group of NYU Stern MBA students including Gabriel Ng (MBA/MPA ‘19), Su-Kyong Park (MBA ‘20) and Kinni Shah (MBA ‘19), took part in a Stern Solutions experiential learning project focused on the cost of recruiting migrant workers in Qatar. In partnership with the Stern Center for Business and Human Rights and the Center’s Research Scholar David Segall, the students collaborated with a construction company in Qatar that has worked to ensure safeguards and welfare initiatives are in place for migrant workers. Over the course of the semester, the students sought to understand the costs of implementing these initiatives to better inform the Center’s future advocacy work. The project included a five-day trip to Qatar, where the students conducted fieldwork and interviewed executives from the company as well as workers. Read an excerpt from Gabriel’s daily blog while in Qatar here. Read an excerpt from Su-Kyong’s daily blog while in Qatar here. 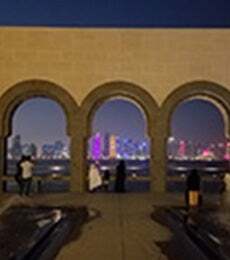 Read an excerpt from Kinni's daily blog while in Qatar here.